even steven: Consumer Reports Battles "Online Tracking"
Consumer Reports Battles "Online Tracking"
Consumer Reports is a great value. For a little over twenty bucks a year, I get high quality reports on a wide range of products. Consumer Reports accepts no advertising. One of the few downsides to subscribing is that I end up supporting their advocacy programs, whether or not I agree with their goals. This Christmas, almost half of us will shop online, making the Internet the top retail destination for gift buyers. And with every click, someone may be tracking you. Online companies can look over your shoulder as you work your way down your holiday gift list. And if you say "stop," no one has to abide by your wishes. The biggest online shopping day of the year -- Cyber Monday, Nov. 28 -- is fast approaching, and you still can't protect your privacy with confidence as you shop. Join our campaign to stop the unwanted tracking once and for all! If you don't mind that companies on the Internet track your activities, then you should be able to choose that. But millions of people would like to say no. Most browser companies have agreed to some form of do-not-track. 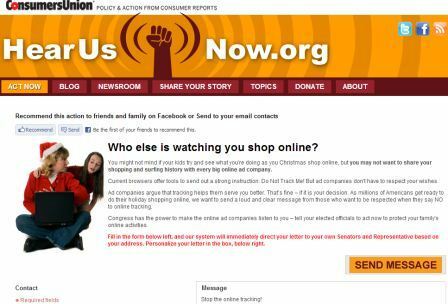 For the past year, technologists, consumer groups and private companies have worked together to find a workable way to implement clear do-not-track instructions that consumers can send from their browsers. But it looks like the advertising companies now want to be able to track you anyway. Your lawmakers should tell the ad companies to respect your do-not-track orders. Do you know others who may be concerned about their privacy when they go online? Please forward this email to them so they can show their support too. I've never been concerned about the cookies placed on my computer or my movements being "tracked". As a friend said: "If I'm going to look at ads, I might as well look at ads for things that interest me". If I was concerned about it, I would implement some defense strategies, but I don't bother. My guess is that the people savvy enough to worry about this already know how to delete tracking cookies, and those who aren't won't have enough awareness to lobby their legislators about it.